Which is closer to Mars, Earth or the Moon? I'm writing a novel and I'm so grateful for the wealth of information. The only answers I find refer to Phobos and Demos Mars moons. As you said, it varies. Imagine I'm in Chicago and you're in London. My little dog is running circles around me. Which is closer to you, me or my dog? While the correct answer is "it depends on where the dog is in its orbit around me", I'd argue that a better answer is "it doesn't matter" - the distance between you and me is so great that any little extra distance one way or the other is essentially nothing more than a rounding error. Traveling from Mars's surface to Earth's surface requires less energy than traveling from Mars's surface to Luna's surface, but traveling from Luna's surface to Mars's surface requires much less energy than traveling from Earth's surface to Mars's surface. Values are approximate and assume optimal routes. $^*$ indicates maximum utilisation of aerobraking. Actual energy expenditure will be more. 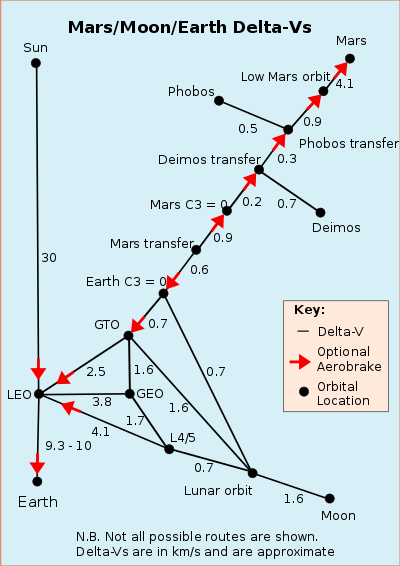 If the characters and/or goods in your novel need to round-trip (or at least there is an approximately equal transfer in each direction), then since Mars-Luna-Mars costs 12.2 km/s and Mars-Earth-Mars costs 19.9 km/s, Luna's surface is significantly closer to Mars's surface than to Earth's surface. Note that in practice, landing on Mars requires retro-propulsion, but that overhead will be approximately equal for travelers arriving from Earth and Luna, so the round-trip comparison stays the same. You can answer the question with Astropy, a Python library for astronomy. 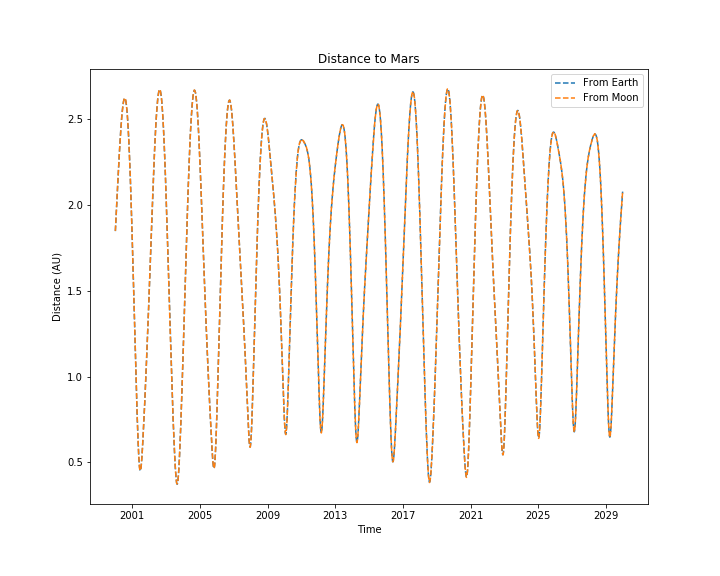 Here's a diagram of distances from Earth to Mars and Moon to Mars, between 2000 and 2030. You can see that the two curves are so close from each other that they look like one single curve. 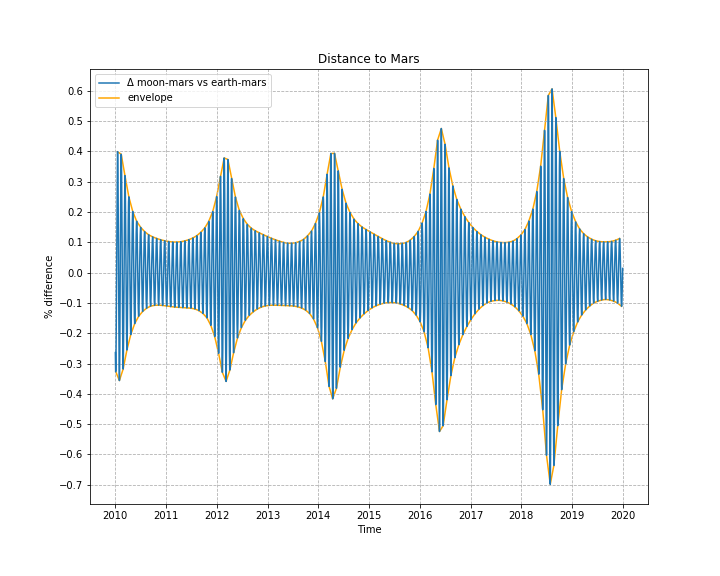 Following @gerrit's advice, here's a plot showing the relative difference between the distances Moon-Mars and Earth-Mars. 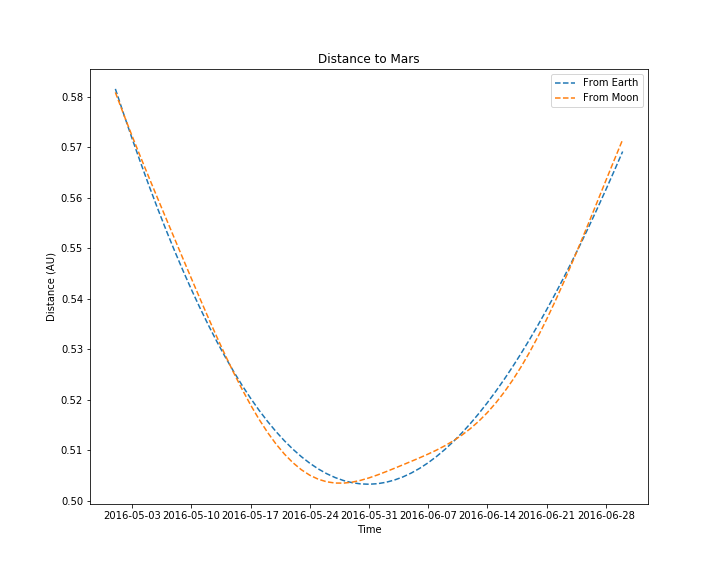 The envelope of the curve oscillates between ±0.089% (during conjunction, when Mars is the furthest) and ±0.69% (during opposition). This difference is positive when Earth is closer to Mars than the Moon. During this period (2010-2020), Earth is closest 49.6% of the time. Over a longer period of time, this percentage gets very close to 50%. In terms of distance, the two swap considerably. But perhaps a more interesting question is, which of the two is closer in terms of the energy required to land. For that, let's look at our friend, the delta-v table. Once one is approaching Earth from Mars, things only become different at the point labeledEarth C3=0 (See $C_3$). From there it is about 2.3 km/s to land on the Moon. To land on Earth requires no rocket propellant, as it can all be lost via the atmosphere, thus it is easier to get from Mars to Earth's Surface than to the Moon. In the reverse direction, it is far easier to get from the Moon to Mars then it is from Earth to Mars. The energy required to leave the Earth is considerable, while it isn't that much from the Moon, relatively speaking. The distance Earth-Moon is 380 thousand km. The distance Earth-Mars varies between 50 and 400 million km, i.e. 3 orders of magnitude more. I think Adam and PearsonArtPhoto have given you the best answers in terms of the effort of getting from place to place. However, since you are asking from the perspective of writing fiction, I want to give a slightly different angle for consideration. Namely economics, and how they might impact the process. It sounds like you are trying to decide where your characters departed from on their trip to Mars. My response is that it would depend on how advanced/common space travel is in your setting. So the questions I would ask are: How often are such trips made? What percentage of the lift capacity from Earth is intended for Luna, Mars, or elsewhere? How do those numbers compare with trips from those places back to Earth? What about transshipping between such points without landing on Earth? The point to all of this is, if your society has reached a point where space travel is frequent enough to make it economical, they will stop trying to build craft that go from the ground on one body to the ground on the other and back. They will instead establish some form of transfer station. A launch vessel would get passengers/cargo from Earth to orbit, where they would transfer to another vessel designed to make the trip to Luna, Mars, or wherever, while the launch vessel returned to Earth for another load. Whether such a transfer station exists at the other end of any given trip would depend on how much traffic goes there. When the volume reaches a point where it is more cost effective to have dedicated surface to orbit craft, and the personnel to operate them, you can expect one to exist. In the case of Earth and Luna, they are close enough together that the same station would serve both. For someplace like Mars, there would almost have to be a permanent human presence there, and frequent trips there and back, to make it worth while. Until such a time, the transfer station at Earth would be used. A couple of other answers have pointed out that the orbit of Mars is outside that of the Earth—that is, it's farther away from the sun. To be more specific about when the moon will be closer to Mars: a full Moon is a full Moon because we're seeing the side of it that's illuminated by the sun. If we drew it out on a plane as viewed from above, when there was a straight line directly from the center of the sun, going through the center of the Earth, then out to the center of the Moon, that would be a full Moon, and the point at which the Moon is closest to the path of Mars' orbit. At new Moon, there would be a straight line from the sun, through the Moon, to the Earth. That's the time at which the Moon is farthest away from the path of Mars' orbit. Note that wording though: "the path of Mars' orbit", not just "closest to Mars" or "farthest from Mars". Depending on exactly when you look, Mars could be on the other side of the sun from the Earth. In this case, a new moon (closer to the sun, farther away from Mars' orbit) is also closer to Mars itself than the Earth is. The Earth's orbit is about 149.6 million kilometers in diameter and Mars' orbit is about 228 million kilometers in diameter (average, in both cases). At their closest, the Earth and Mars are about 78 million kilometers apart. At their farthest, they're about 189 million kilometers apart. The Moon's orbit around the earth is about 385 thousand kilometers. So even when the Earth and Mars are at their closest, the distance saved by being on the Moon instead of Earth is so small that in normal calculations, it's pretty much lost to rounding error. If you're interested in traveling from the Earth to Mars, the actual distance is often nearly irrelevant. When sending rockets over long distances, we often use "slingshot" maneuvers in which the rocket travels (what appears to be) a long ways out of its way. For example, consider this animation of the path Juno followed to get from the earth to Jupiter. It's launched from Earth, travels outward for a ways, then comes back inward toward the sun, and goes quite a bit closer to the sun than the Earth (or Moon) ever does, before finally spiraling back outward to meet up with Jupiter. A spacecraft won't normally even try to just follow a straight line from point A to point B, so the closest approach between the Earth and Mars won't necessarily be the time that it's fastest or easiest to travel from one to the other. Earth and Mars both orbit the Sun - because Mars is further out, its orbital path/circle is slightly larger. 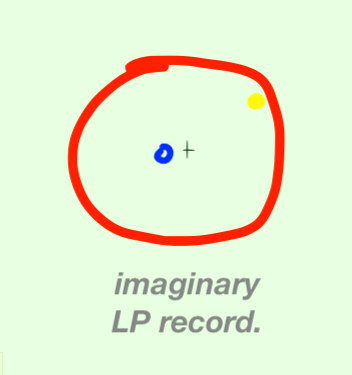 So think of two circles on a piece of paper - the slightly larger one enveloping the smaller is like Mars' orbit around the sun compared to Earth's orbit around the Sun. Now for the moon - while Earth is orbiting the Sun in its "circle", the moon is making a bunch of laps around Earth in a small circle. Now on the paper diagram, you can pick a point on Earth's orbital circle and draw a small circle around that point. This represents the moon's orbit around Earth. With all this, it's clear now that the moon and Earth take turns being closer to Mars. When the moon is in between the Sun and Earth on its mini-circle, Earth is obviously closer to Mars. Conversly, when the moon is on the other side of its circle (putting it in between Earth's and Mars' big circles) it is obviously closer to Mars than Earth is. So it really depends on how Earth, Mars, and the moon happen to be positioned in their orbits at any given time. On average though, the Moon and Earth are about an equal distance from Mars. Here's probably the best thing for your story. During the time period of your story, the Earth is always about the same distance from Mars, whereas the moon spins around Earth. Every 14 days, it gets 1/2 million miles closer to Mars, then every 14 days, 1/2 million miles further away. over the course of long periods of time - years - "all of the Earth and Moon" and "all of Mars" of course change distances dramatically. But the fact is during the time period of your story it will be "about the same" distance from Mars to Earth. every 14 days the Moon moves "back and fore" 1/2 million miles. Whereas during the time period of your story the Earth is always about the same distance. No matter now far the distance between Mars/Earth - of course, as the years pass that changes dramatically - every 14 days the Moon moves "closer and further away" by 1/2 million miles. I particularly appreciated the answer @Adám gave. Wolfram Alpha has several interesting facts about this. If you take the average distance from Earth to Mars and, the average distance from Luna to Mars, it is the same. The average distance to Mars is 14.1 light minutes. Not the answer you're looking for? Browse other questions tagged orbital-mechanics mars the-moon or ask your own question. Disregarding the distance from Earth, would Mars be more habitable than the Moon? How long can a moon orbit a planet? Mars and the missing carbonate. Did Mars once orbit closer to the Sun? Which materials make up a Commercial Satellite? How much goes Phobos in the direction of Mars with a constant force in that direction?